Images by Ronald Brakel - www.brakelfotografie.nl - I think the organizers pushed a little bit on starting this race. 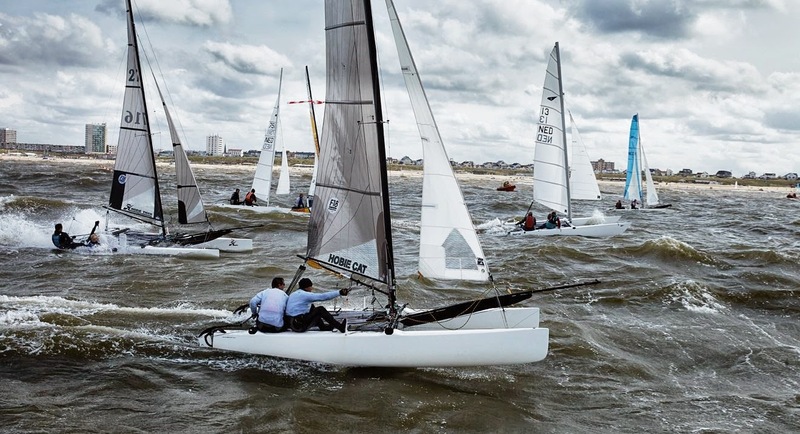 Nevertheless if you are racing a Nacra Infusion like Jorden & Frank, and beyond their sailing experience, you can somehow 'relax' and push a little. 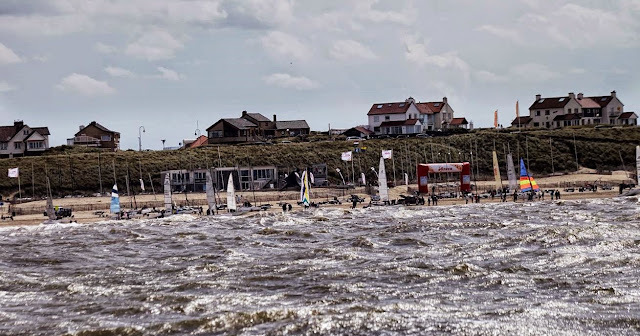 "This weekend the 'Eneco Luchterduinen Race - Zandvoort (Netherlands)' was held on Saturday 19th August and also on Sunday 20th August. The races for Sunday (today) are cancelled because of 7-8 bft of wind. The event is open for ALL catamarans, but is an official class event for Formule 16, Formule-18 ands Carbon 20. (I wasn't at the event, but saw a lot of info online because of the very heavy conditions so I collected some for you and spoke to numbers 1 & 2.) Attached photos can be used (only one time the photographer told me) for this article. Saturday there was a lot of breeze and big waves (maybe the last influence of tropical storm Bertha last week). 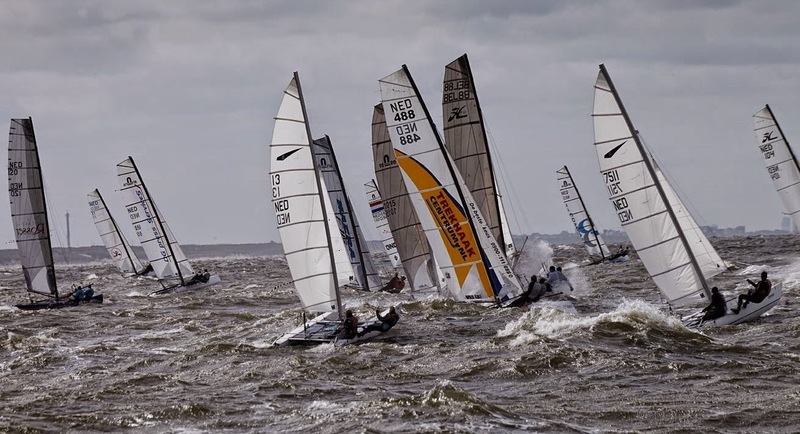 35 of the total of65 boats have started of the long distance race of around 51 km. Only 7 boats made till Noordwijk where the fleet had to go downwind towards the finish, but only 4 (!!!) boats made it to the finish on Saturday. Some boats were crashed in the surf on their way in or out and lost their main sail. Others broke their mast when they tipped over during the race or broke some boards. One boat was very unfortunate, their hull delaminated during the race. Jorden Veenman and Frank de Waard showed their skills in these heavy conditions and were unbeatable. For start till finish they were leading the fleet and never gave it away. 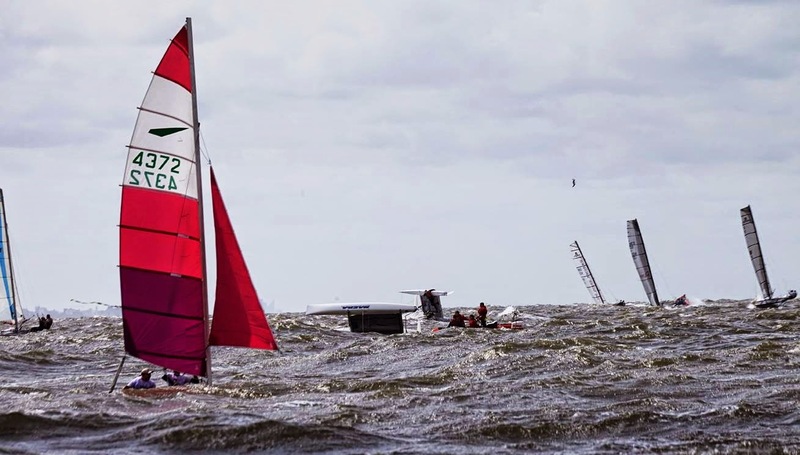 For a long time Rik Duinmeijer/Corstiaan Alessie were in 2nd position, but a broken spinakerpole ended their race. Father and daughter Den Houting (yellow Trekhaak Hobie Wild Cat) took over 2nd position and managed to keep the other boats behind them till the finish line. 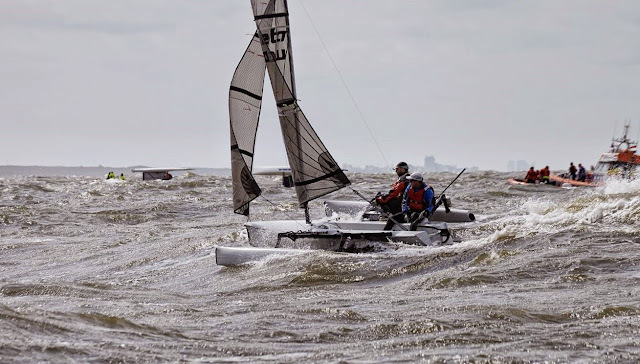 Especially when you keep in mind that Babette den Houting is pretty light and these conditions were heavy for even the most experienced catsailors. But she and her father had a good 'training' at the F18 Worlds last month in Ireland.